Neither the United States nor China can afford a complete rupture, neither has a clear strategy to help Pakistan stabilize. Identifying the mysterious disappearance as a kidnapping is not only embarrassing because Mr. Liu was one of thousands of Chinese nationals working in Pakistan that are guarded by a specially created 15,000-man Pakistani military unit. It is also awkward because it coincides with apparent Chinese questioning of aspects of the $56-billion China Pakistan Economic Corridor (CPEC), a crown jewel of China’s Belt and Road initiative, and increasingly strained relations between Pakistan and the United States. Mr. Liu was accorded military protection even though his project, the Karot Hydropower Plant, located near the Pakistani capital of Islamabad, is not part of CPEC. 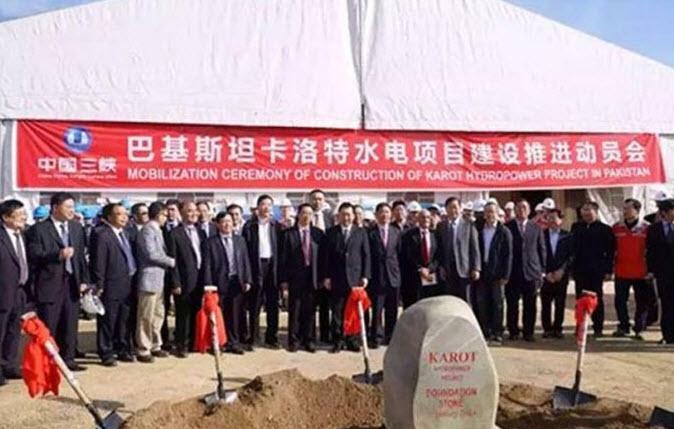 Karot was the first project financed by China’s state-owned $40 billion Silk Road Fund, established in 2014 by President Xi Jinping to foster increased investment in Eurasia. Mr. Liu went missing on December 20 while on night duty. He was last seen walking out of a tunnel at around 3.30am while talking on his phone. No claim for his potential kidnapping or ransom has been made. The fact that Mr. Liu was working on a project in Punjab rather than Balochistan, a troubled region with a history of attacks on Chinese personnel, has set alarm bells off. Police have twice detained for interrogation Chinese and Pakistani workers associated with the Karot project. They are also introducing security and vetting measures for Pakistani nationals working with Chinese personnel. If proven to be a kidnapping, Mr. Liu’s disappearance could not have come at a more awkward moment. China has signalled that it is consideringfreezing further CPEC-related investment until the country’s domestic situation stabilizes. China is believed to have so far invested $29 billion of the $56 billion committed. “Political events in Pakistan have sent China in a watchful mood… I am concerned if we continue to throw surprises to the outside world, then anyone can be forced to rethink their economic investments,” Pakistan’s chief CPEC negotiator, Ahsan Iqbal, told Pakistani daily The News. China had earlier decided to redevelop criteria for the funding of CPEC-related infrastructure projects in an apparent effort to enhance the Pakistani military’s stake in the country’s economy at a time that the armed forces are flexing their political muscle. The Chinese decision that reportedly led to the suspension of funding for three major road projects valued at a total of $850 million – the upgrading of the Dera Ismail Khan-Zhob motorway and the Karakorum highway as well as construction of a 110-kilometre road linking Khuzdar and Basima – suggested that Beijing was not averse to exploiting its massive investment in the Belt and Road to shape the political environment in key countries in its authoritarian mould. The possible investment freeze threw into doubt China’s reliability as Pakistan’s all-weather friend at the very moment that the Trump administration announced that it was cutting almost all security aid to Pakistan, believed to total more than $1 billion, until it deals with militant networks operating on its soil. Pakistan, in response and in advance of a visit by a United Nations Security Council team to evaluate Pakistani compliance with its resolutions, has sought to crack down on the fundraising and political activities of Muhammad Hafez Saeed, an internationally designated terrorist accused of having masterminded the 2008 attacks in Mumbai. Pakistan’s predicament could worsen if Mr. Trump, who has targeted Pakistan in blunt tweets in the past month, decides to tighten the screws beyond cutting aid by taking further punitive action such as sanctioning Pakistani military officials, revoking Pakistan’s non-NATO ally status; increasing drone strikes beyond Pakistan’s tribal areas; designating Pakistan as a state sponsor of terror, and/or pressuring international financial institutions to blacklist Pakistan. The sensitivity of the timing of Mr. Liu’s disappearance was heightened by the fact that some in Pakistan appear to doubt whether CPEC will be the magic wand for Pakistan’s economy and regional geopolitical position that Pakistani and Chinese leaders make it out to be. Criticism of CPEC has focused on doubts about the financial viability of various projects, Pakistan’s ability to repay related debts, a lack of transparency, and assertions that Chinese nationals were usurping Pakistani jobs. In a rare challenging of Chinese commercial terms Pakistan recently withdrew from a Chinese-funded dam-building project. Pakistani Water and Power Development Authority chairman Muzammil Hussain charged that “Chinese conditions for financing the Diamer-Bhasha Dam were not doable and against our interests.” China and Pakistan were also at odds over ownership of the $14 billion, 4,500 megawatts (MW)-hydropower project on the Indus River in the country’s problematic region of Gilgit-Baltistan near disputed Kashmir. The vanishing of Mr. Liu, if proven to be a criminally or politically motivated kidnapping, threatens in the current environment to put Pakistan between a rock and a hard place. Its relationship with its traditional ally, the United States, is on the rocks while its ties to China are proving to be more complex than Pakistani leaders had envisioned. Amid domestic political instability, anti-government protests, and pressure to come clean in its getting a grip on militancy, Pakistani democracy may be saddled with the bill. While neither the United States nor China can afford a complete rupture, neither has a clear strategy to help Pakistan stabilize. China’s solution appears to be tacitly supporting a greater role of the military in Pakistani politics – a formula that has in the past failed to produce results and is more part of the problem than part of the solution.